Not to be confused with the Pontifical University of Salamanca. 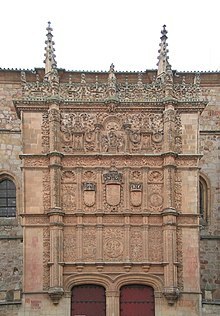 The University of Salamanca (Spanish: Universidad de Salamanca) is a Spanish higher education institution, located in the city of Salamanca, west of Madrid, in the autonomous community of Castile and León. It was founded in 1134 and given the Royal charter of foundation by King Alfonso IX in 1218. It is the oldest university in the Hispanic world and the third oldest university in the entire world still in operation. The formal title of "University" was granted by King Alfonso X in 1254 and recognized by Pope Alexander IV in 1255. Unknown; teaching existed since at least 1130. It was chartered by the pope Alexander IV in 1255. Close up of the plateresque façade of the University of Salamanca. Plateresque façade of the University facing a statue of Fray Luis de León. School Courtyard in the University. The old library of the University of Salamanca. 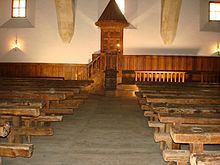 Fray Luis de León's classroom. Its origin, like all older universities, was a Cathedral School, whose existence can be traced back to 1130. The university was founded in 1134 and recognized as a "General School of the Kingdom" by the Leonese King Alfonso IX in 1218. Granted Royal Chart by King Alfonso X, dated 8 May 1254, as the University of Salamanca this established the rules for organization and financial endowment. On the basis of a papal bull by Alexander IV in 1255, which confirmed the Royal Charter of Alfonso X, the school obtained the title of University. The historical phrases Quod natura non dat, Salmantica non praestat (what nature does not give, Salamanca does not lend, in Latin) and Multos et doctissimos Salmantica habet (many and very versed Salamanca has) give an idea of the prestige the institution rapidly acquired. In the reign of King Ferdinand II of Aragon and Queen Isabella I of Castile, the Spanish government was revamped. Contemporary with the Spanish Inquisition, the expulsion of the Jews and Muslims, and the conquest of Granada, there was a certain professionalization of the apparatus of the state. This involved the massive employment of "letrados", i.e., bureaucrats and lawyers, who were "licenciados" (university graduates), particularly, of Salamanca, and the newly founded University of Alcalá. These men staffed the various councils of state, including, eventually, the Consejo de Indias and Casa de Contratacion, the two highest bodies in metropolitan Spain for the government of the Spanish Empire in the New World. While Columbus was lobbying the King and Queen for a contract to seek out a western route to the Indies, he made his case to a council of geographers at the University of Salamanca. In the next century, the morality of colonization in the Indies was debated by the School of Salamanca, along with questions of economics, philosophy and theology. By the end of the Spanish Golden Age (c. 1550–1715), the quality of academics in Spanish universities declined. The frequency of the awarding of degrees dropped, the range of studies shrank, and there was a sharp decline in the number of its students. The centuries-old European wide prestige of Salamanca declined. Like Oxford and Cambridge, Salamanca had a number of colleges (Colegios Mayores). These were founded as charitable institutions to enable poor scholars to attend the University. By the eighteenth century they had become closed corporations controlled by the families of their founders, and dominated the university between them. Most were destroyed by Napoleon's troops. Today some have been turned into faculty buildings while others survive as halls of residence. In the 19th century, the Spanish government dissolved the university's faculties of canon law and theology. They were later reestablished in the 1940s as part of the Pontifical University of Salamanca. The faculty of this university discussed the feasibility of Christopher Columbus's project and the effects his claims brought. Once America was discovered, they discussed the rights of indigenous people as being recognized with full plenitude, which was revolutionary for that period, economic processes were analyzed for the first time and they developed the science of law as it became a classical scholarly focus. It was the period when some of the brightest minds attended the university and it was known as the School of Salamanca. The school's members renovated theology, laid the foundation for modern-day law, international law, modern economic science and actively participated in the Council of Trent. The school's mathematicians studied the calendar reform, commissioned by Pope Gregory XIII and proposed the solution that was later implemented. By 1580, 6,500 new students had arrived at Salamanca each year, amongst the graduates were state officials of the Spanish monarchy administration were nourished. It was also during this period when the first female university students were probably admitted, Beatriz Galindo and Lucía de Medrano, the latter being the first woman ever to give classes at a university. Salamanca draws undergraduate and graduate students from across Spain and the world; it is the top-ranked university in Spain based on the number of students coming from other regions. It is also known for its Spanish courses for non-native speakers, which attract more than two thousand foreign students each year. Today the University of Salamanca is an important center for the study of humanities and is particularly noted for its language studies, as well as in laws and economics. Scientific research is carried out in the university and research centers associated with it, such as at the Centro de Investigación del Cáncer [Cancer Research Centre], Instituto de Neurociencias de Castilla y León [Institute of Neuroscience of Castile and León], Centro de Láseres Pulsados Ultracortos Ultraintensos [Ultrashort Ultraintense Pulse Lasers Centre]. In conjunction with the University of Cambridge, the University of Salamanca co-founded the Association of Language Testers in Europe (ALTE) in 1989. In 2018, the institution will celebrate its eighth centennial, for which preparations are currently being made. The library holds about 906,000 volumes. ^ a b University of Salamanca. "Personal" (in Spanish). Archived from the original on 2009-03-25. Retrieved 2008-09-15. ^ a b University of Salamanca. "Estudiantes" (in Spanish). Archived from the original on 2009-03-25. Retrieved 2008-09-15. ^ VIII Centenario de la Universidad de Salamanca - Reseña Histórica de la Universidad de Salamanca:. Centenario.usal.es. Retrieved on 2013-09-05. ^ La USAL inaugura los cursos de verano con 2.000 estudiantes extranjeros. elmundo.es. Retrieved on 2013-09-05. ^ (in Spanish) INCyL. INCyL. Retrieved on 2013-09-05. ^ VIII Centenario de la Universidad de Salamanca - VIII Centenario de la Universidad de Salamanca. Centenario.usal.es. Retrieved on 2013-09-05. Manuel Fernández Álvarez, Luis E. Rodríguez San Pedro & Julián Álvarez Villar, The University of Salamanca, Ediciones Universidad de Salamanca, 1992. ISBN 84-7481-701-3. Wikimedia Commons has media related to University of Salamanca. Herbermann, Charles, ed. (1913). "University of Salamanca" . Catholic Encyclopedia. New York: Robert Appleton Company.